IdeaPress has launched! - Idea Notion Development Inc. IdeaPress has launched! - Idea Notion Development Inc. Very cool. 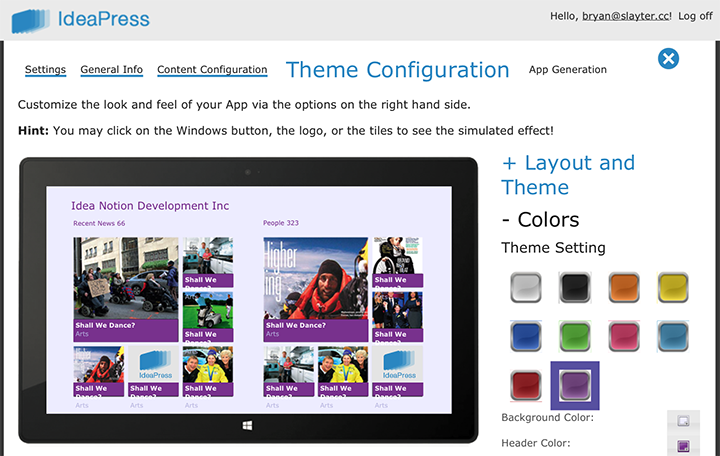 Are there some Word Press blogs --> Windows 8/RT apps that have been created this way that we can check out? So where is the link to IdeaPress? I can't find any link on the web to this new service. Is this vaporware? That's a great concept. Is anyone doing this for generating a Android 4.x app as well? Super, great, please reply to this post when it's there. Thank you very much for your hard work indeed. Mine failed certification from the Windows Store. The ability to comment on a WordPress Post from the Windows 8 Application says "Can't connect to the Service." Is there a key or something I'm missing? I used the wizard from http://ideapress.me to create the Visual Studio Project. Overall the process is great, but having the ability to post a comment from the application and it not working causes Microsoft to fail the certification. Sorry for the inconvenience. We are aware of the issue and will have a hotfix ready by the end of the week. I will let you know once it's in. Thanks for your support. The new release of IdeaPress will fix this bug. If you regenerate your app through the wizard again, it will fix it. Thank you.